The latest iPhone app from Nuance looks to get more out of the power of your voice. Debuting on the App Store Thursday, Nuance’s Dragon Go is a voice-powered search offering. But unlike similar apps—including Nuance’s own Dragon Search—Dragon Go doesn’t just use your voice for search queries, it also figures out precisely what you’re looking for. 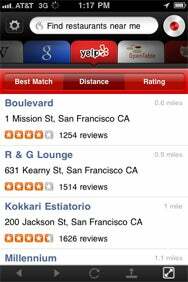 Speak a voice command like 'restaurants near me,' and Dragon Go produces search results from Yelp, with results from other partners just a tab away. Say you’re looking for some place to eat. Tap the record button in Dragon Go, and speak the words “restaurants near me” into your iPhone or iPod touch. Dragon Go will return results—but instead of a standard search page, it will pull up a list of restaurant ratings and locations using a tie-in to Yelp. Were you more interested in making a reservation? Right above the search results, a carousel of tabs lets you slide over to OpenTable search results, where you can place a reservation using that service right from within Dragon Go. Dragon Go can search for more than just restaurants. The app lets you perform voice-powered searches for directions, movie showtimes and tickets, and videos on YouTube. True, all those capabilities either already exist on your iPhone or can be added via other third-party apps. But Dragon Go puts them all in one place and saves you from fumbling with the phone’s on-screen keyboard with its ability to perform voice-powered searches. There’s a music component to Dragon Go as well—in addition to searching for songs on services such as iTunes, Last.fm, and Pandora, you can also search for tickets to live events on LiveNation and StubHub. You can even access music from particular artists or albums stored on your device’s music library from within Dragon Go. In my initial hands-on time with the app, Dragon Go showed a particular talent for helping with comparison shopping. When I said the words “exercise bikes,” the app correctly assumed that I was in the market for one. Search results from Amazon.com popped up on the screen, but similar results from Milo.com and eBay were just a few taps away. Some of the app’s social networking search tools are still a little rudimentary at this point. Dragon Go can run your voice-driven search queries through Twitter, but you’re only searching for mentions in other users’ tweets—you can’t look up specific Twitter feeds. Looking up Facebook information is more miss than hit—the more common the name you’re looking up, the more extensive the page of results that Dragon Go will return. The app also can look things up in Google and Wikipedia, among other popular websites. All told, Dragon Go hits the App Store with 180 content providers, with plans to add more, according to Nuance’s Clayton. For all of Dragon Go’s search prowess, for example, the app can’t look up flight information from specific travel sites. (My test searches for fares and schedules usually returned Google results.) “We want to expand to all kinds of domains,” Clayton told me when I asked about adding other content providers. Dragon Go’s arrival signals the end of the line for Dragon Search—at least in the U.S. Dragon Search, available since late 2009, shares Dragon Go’s tabbed interface but lacks the new app’s ability to discern exactly what you’re searching for. Since Dragon Go is a U.S.-only app at this point, however, Dragon Search will remain available to App Store shoppers in other countries—at least until Dragon Go expands to new markets. Dragon Go is a free download from the App Store. You’ll need iOS 4.0 or later to make it run. Generic Company Place Holder Dragon Go!